A new publication published today by PRI and the Association for the Prevention of Torture (APT) addresses how detention monitoring bodies can help redress the balance between security and dignity in prisons. “Not only are prisons and human dignity compatible, they must be compatible.” Andrew Coyle, A Human Rights Approach to Prison Management. Dignity is inherent in all human beings. It recognises the innate worth and right of individuals to be treated with fairness, respect and humanity. In places of deprivation of liberty, such as prisons, however, an individual’s right to dignity is often ‘trumped’ by ‘security’ considerations. Necessary and proportionate security measures are, of course, legitimate to prevent escapes, prevent violence amongst prisoners, and to create a well-ordered, safe environment, with the space and resources to focus on the rehabilitation rather than on containment and retaliation. From a human rights perspective, security and safety actually constitute an integral part of a state’s responsibility to protect people deprived of their liberty. However, in many countries, whether driven by political or media pressure for tighter security, a punitive approach to imprisonment, inadequate staff-prisoner ratios or a lack of training on inter-personal skills, de-escalation and mediation, prison management often takes unnecessary or disproportionate recourse to security measures in violation of detainees’ right to dignity. An overemphasis on security can manifest itself in a number of ways. Searches – including strip searches and cavity searches – might be carried out routinely, without reasonable suspicion of a security concern, and without regard for privacy or dignity. 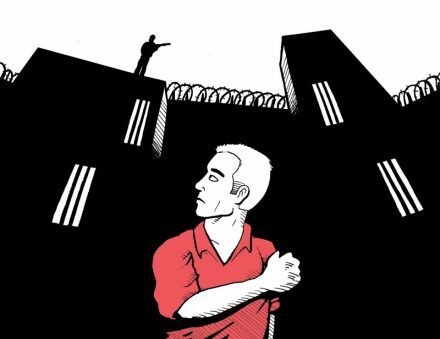 Despite the now significant body of international law restricting solitary confinement to use in only exceptional circumstances, detainees are often kept in isolation, sometimes for 23 hours a day, for prolonged periods of time, and with their visiting rights limited or revoked. Restraints – from various types of cuffs to restraint chairs and body-worn electric-shock restraint devices – might also be used without good reason, and even as a means of inflicting pain or punishment, in contravention of human rights law. However, as Andrew Coyle makes clear above, excessive use and reliance on intrusive security measures often makes matters worse. When prisoners are treated unfairly and without respect for their rights, it is more likely that they will not acknowledge the legitimacy and authority of prison staff. By comparison, positive staff-prisoner relationships with fair treatment, purposeful activities, and techniques of mediation and de-escalation, has shown to be a more effective means to ensure order in custody as it allows for the anticipation of problems and security risks. Today Penal Reform International (PRI) and the Association for the Prevention of Torture (APT) are launching a new thematic paper – Balancing security and dignity in prisons: a framework for preventive monitoring – which examines how bodies monitoring places of detention can help to detect, assess and analyse how security measures impact on the dignity of prisoners. This new thematic paper forms part of the Detention Monitoring Tool jointly developed by PRI and APT within PRI’s three-year EU funded project, Strengthening institutions and building civil society capacity to combat torture in nine CIS countries, which aims to strengthen monitoring mechanisms, including National Preventive Mechanisms, and to develop their capacity to counter torture and ill-treatment. The whole Tool will be available from 15 November 2013 in English and towards the end of the year in Russian. A short paper examining how monitoring bodies can tackle a disproportionate emphasis on security in prison regimes. Part of the PRI/APT Detention Monitoring Tool.